Yesterday, I picked up two beautiful whole yellow tail snappers at our local Whole Foods. It's been quite awhile since I've roasted fish, and I know it is a favorite of my hubby, so when I saw them in the seafood display case I knew I had to get them. It's a rainy Sunday here today, and we came home from church pretty ravenous. This recipe was perfect since it has a quick and easy prep, but looks "Sunday dinner fancy" when they're done. As I started on the fish, hubby asked me, "What's the appetizer?" I told him, "The gum in your mouth." Ha ha. They weren't going to take long to prepare, so no appetizer today honey! Don't worry about him though, he survived and they were worth the wait! 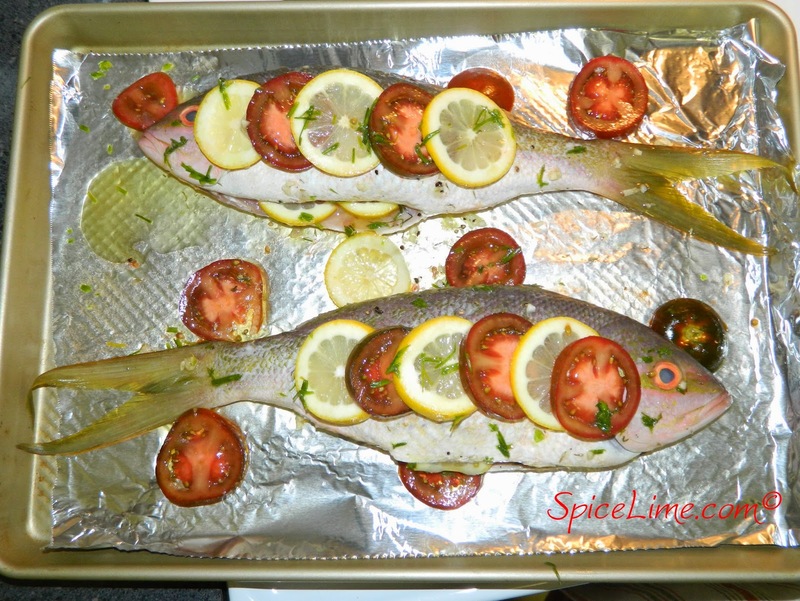 Place non-stick foil on a baking sheet, and place fish on it. Make two to three small scores (cuts) in the skin on top with a sharp knife, about 1/4 inch deep. In a small bowl, combine olive oil, white wine, garlic, salt, pepper, thyme, and chives. Whisk well. 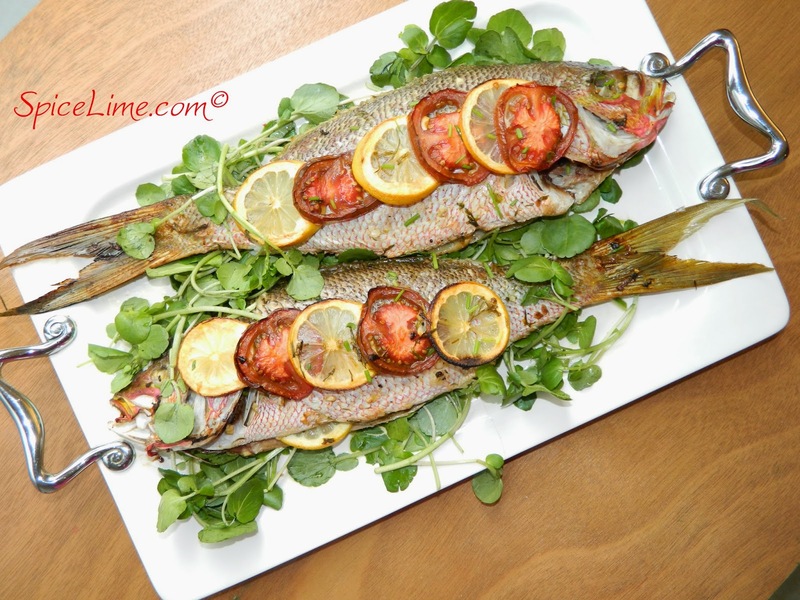 Carefully open each fish and pour some of the oil-herb mixture inside the center. 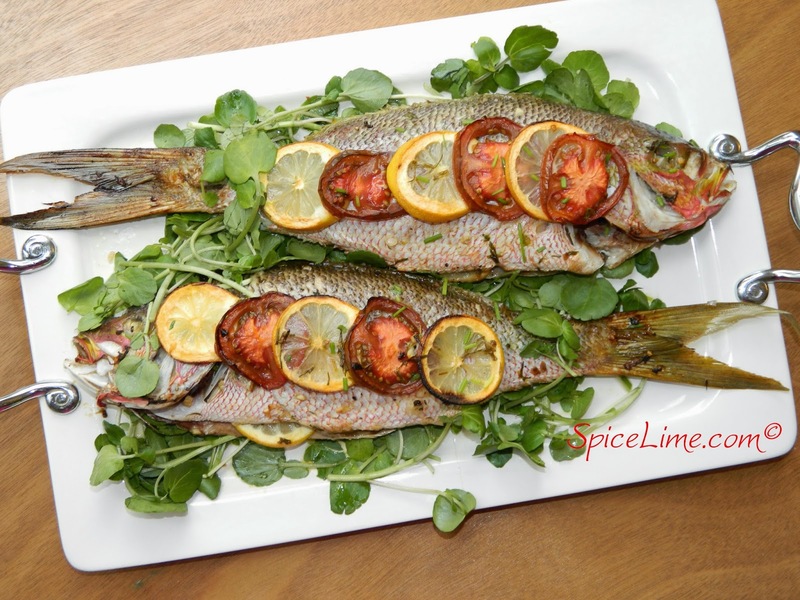 Place two of the lemon slices in each center of the fish. Pour the remaining oil over both fish. Lay kumato and remaining lemon slices on top of each fish, alternating. Roast in oven, until fish is white and flaky, about 35 minutes. *Buy the fish already cleaned from the seafood counter, with the centers sliced open. **I used a kumato (sweeter and different flavor from a regular tomato), but a tomato will work just fine. Served on a bed of watercress. Spinach leaves would be great too!